To be fair, DaimlerChrysler's inattention to these problems is entirely excusable. The needs of enthusiasts who take station wagons and sedans onto a race track are miles off of the mainstream, and they already had the heavier-duty SRT line, although it didn't have components which solved these issues, either. As 2006 progressed and track experience with the LX platform grew, I became convinced we needed a lot of help keeping fluid temperatures down. Just for starters, there had been multiple instances of power steering system failure. In one case the pump blew itself clean off of the car and left itself and its fluid all over Willow Springs' Big Track (thankfully that wasn't me). In other cases, again at Willow Springs, drivers hads to pit their cars thanks to oil temperature gauges that had maxed out while still climbing... after only three laps. Transmission fluid was similarly superheated, despite what one Chrysler engineer huffed to me was a transmission oil cooler that "made ice cubes". 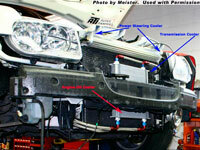 A solution from Mopar for oil cooling was promised but was dragging on interminably for no good reason. But even if that eventually did materialize, nothing was even on the drawing board to solve the other, unacknowledged problems. Like the Frankentake projects I had already undertaken, I decided to tackle this issue. It directly impacted my intended use of the car. I needed a solution soon so I decided to stop waiting for someone else to figure one out for me. Since the 'Frankentake' project had been so well known, I decided to continue the brand and call this set of solutions the 'Frankencooler' system. 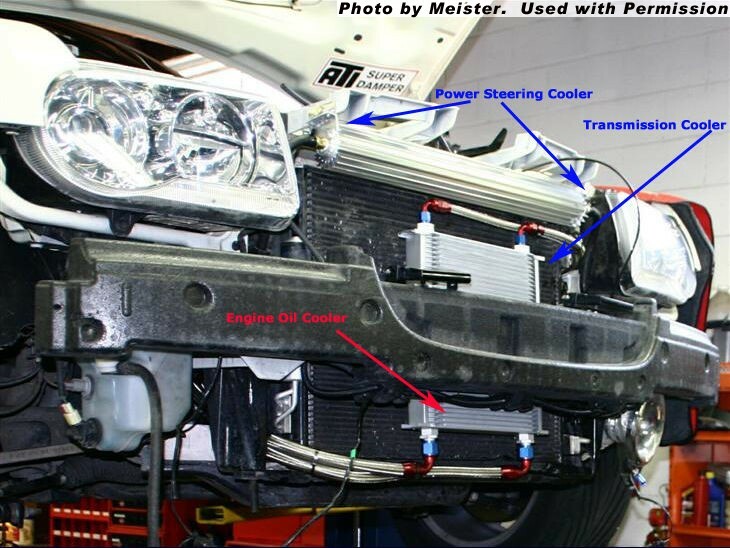 Unlike Frankentake, which was meant to be cheap and able to be put together with minimal tools or even skills, Frankencooler would be strictly a professional project requiring an experienced mechanic or shop to install it.